Your mother’s purported Cherokee and Delaware ancestry was such a big issue that it caused problems up until her funeral? Who do you think you are kidding? Your daddy had an uncle, Frank S. Herring, who was rather prominent in Sallisaw, Oklahoma. 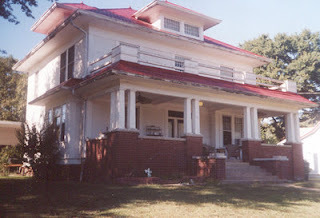 One of his former homes was highlighted on the Old Houses of Sallisaw Tour in 2010. 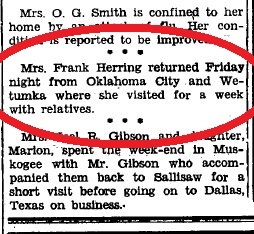 Frank was married to Kitty Herring, the aunt who just happened to be in the Oklahoma City/Wetumka area when your parents got married in 1932. Frank and Kitty had been married 25 years in 1936. They had a party to celebrate this anniversary. At this very special event in their lives, they not only included your purportedly racists grandparents, Grant and Ethel Herring, but also your parents, including your alleged Indian mother who was so disliked by his family, according to you, your father had to elope with her. The Democrat-American; Sallisaw, Oklahoma; Thursday, October 29, 1936; page 3; column 2. Now come on! How stupid do you think we are? If this was the huge issue you make it out to be, why were your parents included in this Herring family celebration only four years after your parents got married? If your mother was so disliked by your father’s racist family for being Indian, would they have included her and your father and your brother in something as special as a 25th anniversary party? This party included your father's grandma, Mrs. J.H. Herring; his parents, Mr. and Mrs. Grant L. Herring; and many others from the Herring family. This was a major Herring family celebration and your parents and brother were included along with the rest of the Herring family. Not only were your parents included in this special occasion, their names were listed in the newspaper as guests. The Herring family seemed to be rather proud of the family, not ashamed of them. Clearly we can see this supposed “Indian-ness” of your mother was not an issue four years after the marriage, so please explain how this was a problem all through life and even at her funeral. Please explain because nothing you have ever said about your claim of being Cherokee is supported by the documentation or evidence available. Now I am not a politician, and I am not a big wig professor at Harvard Law, and I certainly am not a campaign advisor. I don’t know how to do all the things you and your people know how to do. But, there is one thing I apparently know how to do that you don’t -- tell the truth. It is time you stop with the generic stories and offer up some real proof and hard evidence. Otherwise, you are nothing more than an ethnic fraud that has appropriated a history and experiences that don’t belong to you. Stop the lies and apologize. *This is part 2 in a series of 2 about the story Elizabeth Warren tells about her parents' marriage and relationship between her mother's and father's families. Read Part 1 here - When is an elopement not an elopement?